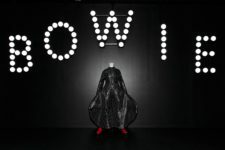 The David Bowie museum exhibition “David Bowie Is” will be released as an augmented reality mobile app for iOS and Android devices January 8th, 2019 – what would have been the late musician’s 72nd birthday. The app will allow fans to explore the hundreds of costumes, videos, handwritten lyrics and original artwork featured in the exhibit. It will also include dozens of items not featured in the original exhibit, including some that will be exclusive to the app.